Looking for a car that slaps a smile on your face? 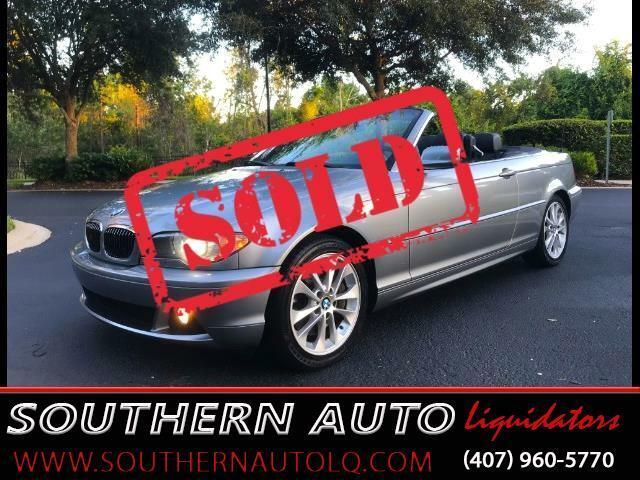 This beautiful Dark Grey 2005 BMW 330ci Convertible with a Navy Blue Soft Top will not disappoint. If you have been to our website before, you’ll notice that we almost always have a BMW 3-series in stock. That is because it is our favorite, in terms of their endless driving pleasures and reliability. The BMW 3 Series cars are the aspiration for every automaker building a sports sedan or smaller luxury sedan. And there’s a good reason for that. The 3 Series is superb. They blend luxury and sport with high levels of quality, making owning them a joy. This 330ci is in absolutely beautiful condition and I love this part of my job: The test drive... Wow, this car flows smoothly through the gears, it loves the road, hugging the curves. The BMW 330Ci features a 3.0-litre engine with 24 valves, DOHC, variable valve timing, and six cylinders. All of these points factor into a resulting 225 horsepower for an exuberant highway drive. This BMW's Equipment includes adjustable power front seats, remote keyless entry, power windows, cruise control, steering wheel controls, cabin-air filtration, fog lights, leather seating, fine wood trim, 17-inch alloy wheels, includes fully automatic soft top, sport leather steering wheel, ABS Brakes, Air Conditioning, Traction control w/Dynamic Stability Control , AM/FM Stereo, Auxiliary Audio Input, CD Audio, Hartman Kardon Sound System, Cruise Control, Leather Seats, Power Locks, Power Mirrors, Rear Defroster, automatic climate control, illuminated vanity mirrors, front reading lights, footwell lighting, heated seats, it really does have it all. This BMW 3 series offers excellent handling, performance and smooth quiet drive. Steering is sharp and responsive. This 330 is exceptional. Come by today. You won't be disappointed!!! Drive Fun, Drive Safe, Drive Cool.